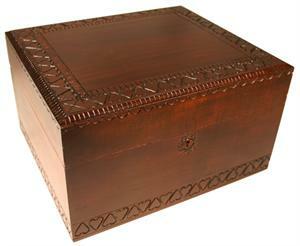 Beautiful and delicate heart shaped carvings surround the lid and base of this generously sized urn. Adding to it's charm is the ability to lock the urn with the included brass colored key. Made in Poland of seasoned and aged Linden wood to ensure lasting beauty. You may also choose to embellish and personalize the urn with one of our brass plates.